Though we are not often included in the recorded history of our world, women have been here all along. We have been bringing our unique gifts to shape our families, our communities, our workplace, our church, temple or mosque. We have enriched the culture with both innovation and continuity, courage and grace. We have embodied Meg Wheatley’s definition of leadership: A leader is anyone who is willing to help. In the December 15 issue of The Interfaith Observer, I write about a few of the women who have shaped and guided the modern interfaith movement in the past 20 years. 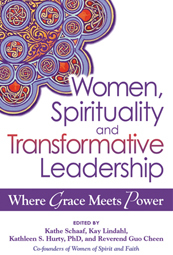 I was so inspired by what I learned about the remarkable women of interfaith that Women of Spirit and Faith will celebrate more of them in a new series in January 2013 on our blog The Divine Feminine, exploring the theme “Standing for the Greatness of Each Other”. Women everywhere are invited to contribute a post celebrating and honoring another woman who has inspired them. Send your contributions to divine.feminine.wsf@gmail.com. It feels good to write women back into history.